Rainbow Riches Free Spins Slot Machine: Give It A Shot With No Sign-Up Bonus! 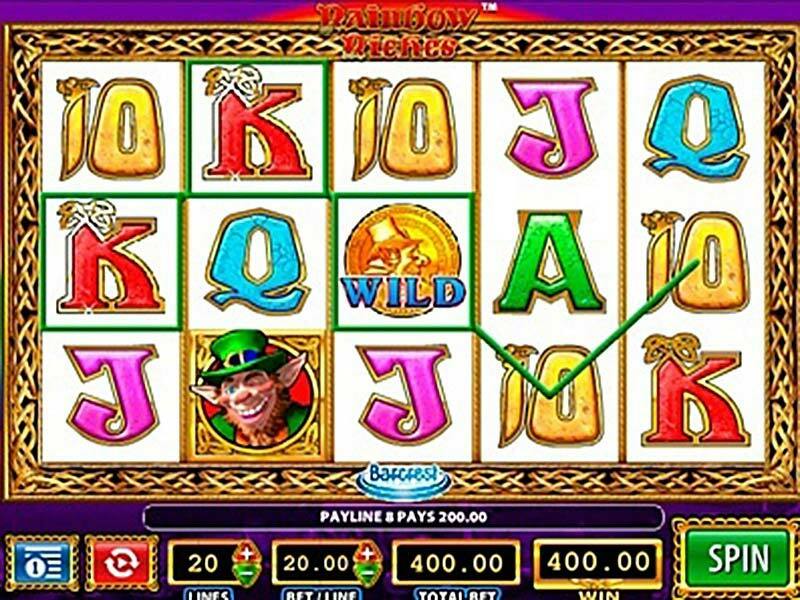 Rainbow Riches slots are developed by Barcrest and it is perfect for any type of player regardless of his gambling experience. The playful leprechaun theme is something different and surely much more entertaining than your classic fruits and gems. All the graphics and the sound effects of Rainbow Riches slots are carefully chosen to tell an enchanting story through this little game. Let’s see what makes this machine so special! First of all, Rainbow Riches slots have a5x3 reel grid that is common with complex machines that are perfect for medium and advanced players. Due to the fact that it has 20 flexible paylines, even beginners will be able to enjoy Rainbow Riches free spins and personalize the gameplay as they wish. Next to the Lines button, there is the Bet/Line option that allows you to choose the coin value you wish to place on each line. The minimum value is 0.01 but it goes up to 5, creating a total maximum bet of 100 coins. The betting options are generous and players will get to enjoy a lot of rounds if their strategy is smart enough. Unfortunately, while other slots have an autoplay, developers decided not to include this feature so players will have to click Spin whenever they wish to start a new round. This comes as a disappointment for Rainbow Riches slots because even classic online machines have included the automatic mode. The highest paying symbol on the reels is of course represented by the Golden coin and, whenever you find five of a kind, you’ll get 2500 extra coins! The graphics and the visual effects are quite decent even though there aren’t exactly top-notch. They have a vintage look that some players prefer because it reminds them of land-based machines. 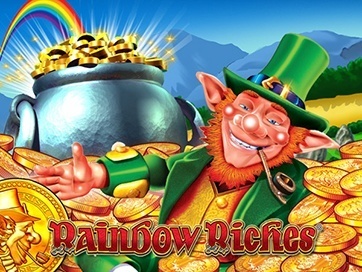 The background of Rainbow Riches slots displays the Leprechaun's home - the rainbow! And since these playful green elves love gold so much, the reels are made of a golden frame. All the symbols are animated and whenever you unlock a combination featuring the special elements I mentioned above, they will all come to life. Even though there is no background music, the sound effects are entertaining enough. The entire vibe of this game is actually quite enchanting! Overall, the slot machine is to keep you spinning over and over again. The gameplay is easy to understand yet challenging enough and the visual effects are creative and entertaining. Don’t miss the chance to try Rainbow Riches slots for free!